Sweets in the City Website Now Live! Sweets in the City is the company that's jointly owned by BBC Apprentice winner Sarah Lynn and her business partner Lord Sugar. If you watched the latest series of The Apprentice on BBC One, you should already be familiar with Sweets in the City and the beautifully-presented sweet gifts that they sell. These customisable products make perfect presents for birthdays, anniversaries, and all sorts of other special occasions. As you may be aware, we at Designer Websites have worked with a number of Apprentice winners in the past, including Ricky Martin, Dr Leah Totton, Joseph Valente and Alana Spencer. After the 2017 final aired and Sarah was revealed as the joint winner (along with recruitment consultant James White), she approached us to ask if we would be willing to work our magic on the SitC website. Of course, we jumped at the opportunity! Work on the new and improved Sweets in the City website is now complete, and you can view it at www.sweetsinthecity.co.uk. Brand new design - Our skilled designers gave the SitC website a completely new look. We think it perfectly encapsulates the company's high-end credentials (their products are sold in Harrods and Selfridges, after all) while still retaining a strong sense of sweetness and fun. Improved site navigation - We have made it easier to browse SitC's product range and find exactly the right gift for any given occasion. Website users can now search by price, recipient, occasion or theme. Letterbox treats - One of the big ideas that secured Sarah's Apprentice victory was the option for customers to send small, letterbox-friendly sweet gifts through the post. This idea has now been realised, and the new SitC website allows you to choose from 10 different box designs, add your own personalised text, and fill the box with whatever sweets you think the recipient might fancy. Option to buy in bulk - What if, instead of purchasing a lovingly hand-packaged assortment of your best friend's favourite sweets, you just want to order yourself three kilograms of cola bottles? Well, thanks to SitC's new 'bulk buy' page, now you can! Improved back-end functionality - In addition to the above, we gave the back end of the SitC website a complete overhaul, making it easy for the company to control the content of their web pages. The new Sweets in the City website is a fantastic example of what the Designer Websites team can do. Our designers, developers and SEO experts are adept at creating sites that are carefully tailored to the client's requirements and target audience - if you need a new website for your business, please get in touch now to request a FREE quotation. Search engine optimisation (SEO) is a pretty complex subject. Gone are the days when all you had to do was pick a keyword and stuff it into your page copy as many times as possible - if you want to conquer the Google results in 2018, there are all sorts of different factors you need to think about. And of course, since the algorithms are always changing, you'll need to keep your eyes open and stay abreast of all the latest updates if you don't want to be left behind. 1. Check your site's health on Google Search Console. Google Search Console (google.com/webmasters/tools/home) is an indispensable tool that all website owners should use. Once you've added and verified your website, check out our beginner's guide to make sure you know what to look out for. 2. Submit your sitemap to Google. Go to the Crawl section in Google Search Console and select Sitemaps. This is where you can submit your website's XML sitemap file to Google - this makes it easier for the big G to index your content, and the Sitemaps tool will also inform you of any problems that are affecting pages you submit. 3. Take a good look at your title tags. There are many different factors that decide whether a web page makes it into the top 10 Google results, but the page's title tag may be the most important of all. A page's title tag should ideally be no more than 60 characters in length, and it should be a clear, concise, and keyword-rich description of what that page is for. Use Moz's title tag preview tool to see what your title tag will look like on Google (this is a good way to identify whether your title tag is too long). 4. Make sure your meta descriptions are snappy and engaging. Unlike the title tag (see above), your page's meta description probably won't have a huge impact on rankings. However, it can make the difference between a Google user clicking on your result and scrolling straight past it. You know the short paragraph of text that appears under most Google results? Very often, that blurb is pulled directly from the page's meta description. 5. Check for keyword cannibalisation. Keyword cannibalisation occurs when a website has two (or more) pages competing against each other for a specific keyphrase. It should be avoided, since Google may not be able to discern which page you actually want to rank for the keyphrase in question. For more information on keyword cannibalisation and how it can scupper your SEO efforts, read our blog on the subject here. 6. Claim your Google My Business listing. Google My Business listings are crucial for local businesses with bricks-and-mortar locations that are open to the public, but even if your business is online-only, you should still think about claiming your listing. 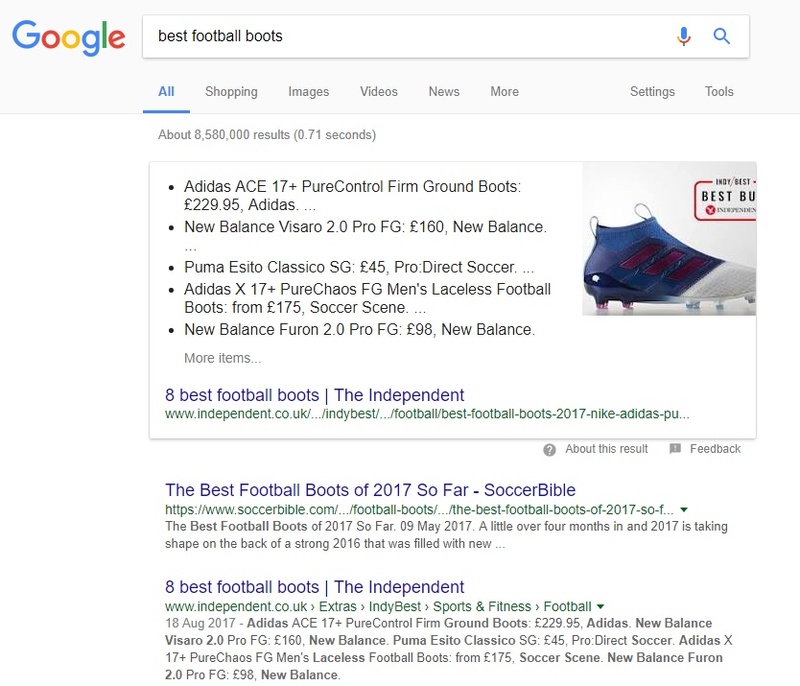 Go to google.co.uk/business and enter your company details so that Google can show more information about your business - don't worry, you can keep your address hidden if you don't want people turning up on your doorstep. 7. Link to high-authority websites. Some people will tell you that you should never link out to other websites, but the evidence seems to suggest that outgoing links can have a positive effect on your rankings when done carefully. Just make sure that you're linking to authoritative sites that are relevant to the topic you're focusing on. 8. Share your knowledge in blog posts. If your company's website doesn't have a blog, you're missing out on a huge opportunity to share your expertise and get your brand seen by a wider audience. Google loves in-depth, well-written articles from people who know what they're talking about, and nobody knows your business better than you do, so what are you waiting for? Get writing! To make sure you're writing blog posts that will actually drive traffic to your website, we recommend using tools like Google Keyword Planner and AnswerThePublic.com to find out what people search for when they're looking for information on your specialist subject. 9. Add alt tags to your images. Google's bots are very clever when it comes to understanding and indexing text-based content, but they're not so good with images. In order to help them index your images properly (and potentially show them as results on Google Images), you should make sure that every image on your website has an alt tag that gives an accurate description of what the image depicts. Not only will this help you to capture traffic from image searches, it may also boost the perceived relevance of your pages if the alt tag is relevant to the keywords you're targeting. For example, if you're trying to rank for the term 'how to fix a dripping tap', your page may rank better if it features some pictures of taps, pipes, plumbers, and other related things/concepts. 10. Above all, focus on search intent and user experience. Search engine optimisation shouldn't be an attempt to game the system or 'trick' Google into ranking your website. Ultimately, your goal should be the same as Google's goal: to give each user the best possible answer to their query. These are just a few examples. Put yourself in the shoes of an average website user and go through your website from their point of view - is there anything that could be improved, or any parts of the buying journey that are needlessly complicated or fiddly? For more help with this, read our blog about search intent. Do you need someone to take a proper look at your website's SEO? Get in touch with the Designer Websites team today - we're great at boosting organic traffic and creating smooth user journeys! Further reading: Why Won't My Website Show Up on Google? Why Won't My Website Show Up on Google? It's frustrating when your website can't break onto the first page of Google results for that high-volume keyword you've been trying to target, but it's even more frustrating when your website isn't showing up on Google at all. In order for a page to appear as a Google result, it has to be included in Google's index. When Google notices a new website for the first time, its bots 'crawl' the site and report back so that the site's pages can be added to the index. However, Google don't index all pages indiscriminately – even they don't have the luxury of unlimited server space. For this reason, if a page doesn't meet certain requirements, Google won't bother to index it. Their algorithm might even decide that none of your pages add any value to the Internet, in which case your whole website may be excluded from the index. And if you're not in the index, you can't show up in the SERPs (search engine results pages). If you think Google isn't showing your website in the search results – even for terms that you really ought to be ranking for – the first thing to do is find out whether or not you're even indexed. 1. Open Google Chrome (or go to google.com). If you use Google Search Console to manage your website, you can instead log in and take a look at the Index Status report. This tells you how many of your pages Google currently has indexed, if any. Google hasn't noticed your website yet. If your website only recently went live, it may just be that Google's bots need a little longer to get around to crawling it. You can hurry them along by adding your site in Google Search Console and submitting your sitemap file in the Sitemaps report (or using the Fetch as Google tool – be sure to click 'Submit to index'). Google's bots can't access your pages. If your web developer has mistakenly a) blocked your website in the robots.txt file, or b) placed a 'noindex' tag on pages that are supposed to be indexed, this will prevent Google from accessing and indexing your content. If neither of these apply, there are several other reasons why Google may be unable to view your site – perhaps your site was down when Google attempted to crawl it, or maybe your pages take too long to load or cannot be viewed without logging in. Google has penalised your website by de-indexing it. Sometimes, Google will exclude websites from the index as a punishment for breaching the search engine's guidelines. If you have been engaging in unnatural link building practices, filling your site with low-quality or duplicated content, or otherwise doing something you shouldn't have been, your absence from the Google SERPs may be a direct result of your bad behaviour. All of your pages are indexed...except the one that matters. Just because most of your site is indexed doesn't necessarily mean that the bots haven't missed something. It may be that a crucial page has been excluded, probably because its content is too similar to that of another page on your site. Google won't waste server space indexing two pages that are near-identical, so make sure your key landing pages aren't being edged out by other, lower-priority pages. Your content needs to be improved. It may be that you're not ranking for that high-volume keyword because Google doesn't think your content meets the needs that the query expresses. Look at the sites that do rank for your chosen keyword, then compare them to your site – what do they do that yours doesn't? Do they provide a better answer to the searcher's question? Does their user interface provide a better, smoother journey? Do they offer a better product range, or more information on the products they sell? Ask yourself these questions and make sure your pages are as good as they can be. You need to boost your website's ranking signals. If all of your pages are indexed and your content is utterly perfect...and you're still not showing up in the SERPs...it may simply be that your website doesn't carry as much weight as other sites do. Google's algorithm takes dozens of different factors into account when deciding which websites should rank the highest, but links are among the most important ranking factors of all. If your competitors have links from lots of high-authority websites (e.g. trusted news outlets, authoritative academic resources, popular content platforms like Buzzfeed), then you'll probably need to get some similarly high-powered links – AND make sure that your content is better than everyone else's – in order to outrank them. If you need help getting your website ranked, please get in touch with the website optimisation experts at Designer Websites. Contact us now to discuss your requirements. The firm's clients include GP practices, consultants, registrars, and dental clinics. Why did Sandison Easson come to us? In addition to the mobile-friendly design and easy-to-use enquiry form, the new Sandison Easson website features a professional-looking 'Meet the Team' page, a client login function, and a blog where the firm will be able to share all their latest updates and insights. See the site for yourself at www.sandisoneasson.co.uk. If you need a professional-looking website for your business, please don't hesitate to get in touch with the team here at Designer Websites. Request a free, no-obligation quote for your project here. The people of Wales spend approximately £1.4 billion on electricity and gas every year. Very little of that money stays in Wales, with most of it going into the coffers of large energy suppliers based in other parts of the UK. But a new Welsh energy company called One Wales Energy / Un Ynni Cymru are looking to change that. All of the company's operations (including their contact centre) are based right here in Wales, meaning that their customers' energy fees will be going back into the Welsh economy instead of leaving the country. One Wales Energy / Un Ynni Cymru have also pledged to improve the wellbeing of Welsh communities via a Charitable Foundation and a Community Affiliate Scheme that allows local groups to raise funds by recommending One Wales to their members. As a proudly Welsh company, we at Designer Websites were very happy when One Wales Energy asked us to create a new website for them. Their goal was to drive pre-registrations from people who are interested in changing energy suppliers (the company are planning launch their service in early 2018), so we knew that the site would need to communicate the company's key selling points - competitive rates, simple tariffs, a commitment to working towards sustainability, and of course the benefits for Wales and its communities - in a clear, appealing fashion. Does your business need a new website? Contact Designer Websites today to request a quotation.